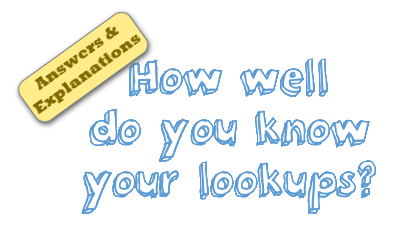 Last week, we had our very first quiz – “How well do you know your LOOKUPs?“. I hope you have enjoyed it. *Questions that are ambiguous are marked with a * below. Here are the answers & explanations this quiz. If your lookup table is in ascending order, then you can omit 4th parameter and VLOOKUP will find either exact or approximate match. We use 4th parameter as FALSE when our list may not be in any particular sort order and we are looking for exact matches. We can check whether a value is present in a list or not using any of below formulas. COUNTIF(range, value you are looking) will be >0 if value is available. VLOOKUP will always find the first match (assuming you specified FALSE in last parameter). Related: Finding 2nd, 3rd matches using VLOOKUP. Q4. To trap errors in VLOOKUP, we can use this formula. Invoice ID, Customer ID, Amount, Due DateNow, you want to lookup the invoice ID for a given Customer ID. Which of below formulas you would use? Assume that your list is not in any particular order and there are no duplicate customer IDs. Although VLOOKUP is very powerful, it has one limitation. It can only search in left most column and get values from columns to right. To lookup on a column in middle and get values from either left or right, we can use below alternatives. This will tell us how many times each invoice number is repeated up to that point. Related: Finding 2nd, 3rd … matches using VLOOKUP. Nah, it will return #N/A error. Q8. You have a list of employee names & their salary details. in 5 columns – A1:E100. Do you know that you can use arrays for 3rd parameter in VLOOKUP? When you do it, you will get values from all column numbers mentioned in the array. So we get Joyce’s salary, special allowance, travel allowance and bonus amounts. When wrapped in SUMPRODUCT, this will just be the sum of all these numbers. Related: Extracting values from multiple columns using VLOOKUP. To get 3rd column value, we need to replace 2 with 3. What if we can write 1 formula and drag it side-ways so that 2 becomes 3,4…24,25? Apart from COLUMNS(), you can also use ROWS(), COLUMN(), ROW() or simply a set of 25 numbers typed in a range and using cell references in place of 2,3,…24,25. *Q10. You have 3 columns of data – Customer ID, Invoice ID & amount. You want to lookup by a combination of customer ID & invoice ID and fetch the corresponding amount. Which formula will help you? Related: Various techniques for multi-condition lookups. Want to master Lookup formulas? Worry not. I am always looking out for you 🙂 Check out below pages for awesome resources, explanations & examples on Excel lookup formulas. Introduction to VLOOKUP formula – what is it & how to use it? If you are searching for more on Excel, Advanced Excel, Dashboards so that you can become awesome at your work, please consider joining my Excel School program. This online course helps you use Excel like a pro & do awesome things at your work. The course has more than 24 hours of video training, 50 downloadable workbooks & interactive online classroom, all designed to help you become better. Click here to know more about Excel School & join us. This is why I like your blog. Your explanations are so simple and straightforward for the excel rookies like me. It is a very good initiative! In question 9 you can use columns assuming that the data you want to republish is in the same order. Personally I prefer to use a match function to the heading of each particular table. This will allow sorting, or reordering of columns while still keeping data integrity the same. It's all explanations and updates so simple and very nice. Awesome work you're doing Chandoo! Keep up the great work! On vlookup, there is a tiny column counter that appears at the top right or left when you drag across the columns of the table array. This counter is what I use in the col_index_num. How do you turn on/off this counter? in question 9, the suggested formula does not give the desired result. Problem is the lookup value changes when formula is dragged to column C & above. Lookup value should be cells in column A, however when formula is dragged from say B2 to C2 lookupvalue becomes B2 in cell C2 (it should be A2). Kindly suggest how to deal with this. Please copy vikrantarora25@gmail.com in your response. I use vlookup all day every day at work. However, I only know how to do one column at a time which means I may do 9 vlookups for one spreadsheet. I tried to follow the instructions above on how to do multiple columns at one time but I can't get it to work. Is there anywhere that shows screenshots of each step when doing multiple columns? can you post a sample of your file with what your trying to get out of it? Here is the link to an example of a worksheet. I want to bring the information in columns B-F on Tab 2 over to Tab 1. I can do this by doing a vLookup for each column but I want to be able to bring over all of the columns at one time with one vLoopkup. I still can’t get it to do. I know I am just doing something wrong. Can you take screenshots of each step you do and either post or email them to me? I still can't get it to do. I know I am just doing something wrong. Can you take screenshots of each step you do and either post or email them to me? I tried that formula and it said "The formula you typed contains an error." Even if the formula works I still need to know how you came up with that formula so is there a way to send me screenshots or to fill in what i need in the following fields?